The new Porsche Panamera now reconciles two contrasting characteristics more than ever before: the performance of a genuine sports car and the comfort of a luxury saloon. In its second generation, Porsche’s Gran Turismo has been redefined and realigned, advancing to become a performance icon of the luxury class. With the latest transformation, the Stuttgart-based manufacturer has systematically improved the Panamera concept and is therefore introducing a four-door car that has been redeveloped and redesigned down to every last detail. This includes wholesale changes to the engines and transmission, a perfected chassis, and an interior concept reinterpreted for the future. The new Panamera also bridges the world of ambitious sports cars and that of comfortable cruising cars, thanks to a range of newly implemented features such as rear axle steering, active roll compensation and three-chamber air suspension. At first glance, the unique concept of this four-door Porsche is reflected in a new expressive design. It is unmistakably a Panamera, with recognisable sports car aesthetics, such as pronounced shoulders, athletic flanks and an extremely fast roof line that is 20 mm lower at the rear. This typical Porsche flyline creates a stylistic link to Porsche’s design icon, the 911. The new model’s interior has been reinterpreted for the future with black panel surfaces and interactive displays which combine to present an intuitive user interface similar to a smartphone, with all the practical requirements for controlling the car. For the benefit of the driver, front and rear passengers, classic hard keys and conventional instruments have been significantly reduced. Instead they have been replaced with touch-sensitive panels and individually configurable displays which take centre stage in the new Porsche Advanced Cockpit. Despite having an extended range of communication, convenience and assistance systems, operation of the new functions is now easier than before. The Porsche Advanced Cockpit transforms the analogue world into the digital present of mobility, whilst leaving room for traditional elements, such as the centrally positioned tachometer in the instrument cluster, which is a tribute to the 1955 Porsche 356 A. The second generation Panamera engine has been redesigned to produce more power, whilst significantly improving fuel economy and reducing emissions. The Panamera Turbo now features a new biturbo direct injection engines and can be equipped with a permanent all-wheel drive system and a new eight-speed Porsche dual-clutch transmission (PDK). The V8 petrol engine in the Turbo derivative now delivers 550 hp. In keeping with the overall concept of the Panamera, the chassis unites the cruising comfort of a luxury saloon with the performance of a true sports car. This is achieved by supplementing the basic layout with innovative systems such as an adaptive air suspension with new three-chamber technology, including Porsche Active Suspension Management (PASM electronic damper control), the enhanced Porsche Dynamic Chassis Control Sport (PDCC Sport) system including Porsche Torque Vectoring Plus (PTV Plus) and active roll stabilisation, as well as a new electromechanical steering system. The integrated 4D Chassis Control system analyses and synchronises all chassis systems in real time, therefore optimising the road performance of the new models. In combination with improved break performance, Porsche is now also introducing rear axle steering adapted from the 918 Spyder and 911 Turbo to its Gran Turismo cars. The Panamera is equipped with a range of standard and optional assistance systems which make life while driving more convenient as well as safer. Night Vision Assistant is a new feature which uses a thermal imaging camera to detect people and large animals by displaying a colour highlighted warning indicator in the cockpit. If the optional new LED Matrix Headlights (with 84 image points) are selected, people beyond the visual range of the dipped beam headlight are also illuminated briefly, should they be in the computed driving corridor, enabling the driver to avoid critical situations in advance. The new, powerful and fuel-efficient Panamera turbo engine features turbochargers integrated centrally into the V of the cylinder banks. This central turbo layout yields numerous benefits including compactness and a lower mounting position which results in a positive effect on the vehicle’s centre of gravity. The short paths between the two turbochargers and the combustion chambers enable the production of spontaneous throttle response. Engine performance can be further increased using the optional Mode Switch with the Sport Response Button. First introduced in the Porsche 918 Spyder, the Mode Switch rotary ring on the steering wheel can be used to activate one of four driving modes (Normal, Sport, Sport Plus or Individual). Located at the centre of the switch is the Sport Response Button which when pressed activates the maximum power potential of the Panamera. With its powerful petrol engine, the Panamera Turbo’s 4.0-litre biturbo V8 develops 550 hp at 5,750 rpm, with a maximum torque of 770 Nm (between 1,960 and 4,500 rpm). It has 30 hp more than its predecessor as well as a torque increase of 70 Nm. The Panamera Turbo accelerates to 100 km/h in 3.8 seconds, whilst with the Sport Chrono Package the sprint time is down to 3.6 seconds. The new turbo model features a top speed of 306 km/h and a power-to-weight ratio of just 3.6 kg/hp. A lower combined fuel consumption of 9.4 – 9.3 l/100 km, is up to 1.1 l/100 km less than that of the previous model (NEDC), therefore equating to CO2 emissions of 214 – 212 g/km. Porsche uses complex twin-scroll turbochargers to supply compressed air to the V8’s combustion chambers. The two counter-rotating chargers produce maximum torque figures at very low engine speeds. The Panamera Turbo is also the first Porsche to be equipped with the new adaptive cylinder control in its engine. In part-load operation, the system temporarily and imperceptibly turns the eight-cylinder into a four-cylinder engine. This reduces fuel consumption by up to 30 per cent, depending on power demand during the four-cylinder phases. The exterior of the Panamera has also been sharpened, with the car now 5,049 mm (+34 mm) long, 1,937 mm (+6 mm) wide and 1,423 mm (+5 mm) tall. Despite the slight increase in height, the four-door car looks much lower and longer. This is primarily due to the reduced height above the rear of the passenger compartment – reduced by 20 mm – while maintaining consistently good headroom and changing the car’s overall image completely. The wheelbase has been increased by 30 mm to 2,950 mm, this too lengthens the car’s proportions. The front wheels were shifted further forward, reducing the front overhang and therefore increasing the distance between the A-pillar and the front axle. The rear overhang is longer, giving the car a more powerful appearance. The Panamera has only grown six millimetres in width, but it feels like several centimetres, an effect created by features such as the A-shaped air intake, which extends out to the sides and creates a completely new front-end design. At the same time, a precisely designed crossbar in the radiator grille emphasises the car’s width. The arrow-shaped bonnet over the engine accelerates this visual effect further forward and lower than before – due to the prominently contoured powerdome, whose lines now reach into the bumper. The lower front end is enabled by the new compact construction of the engines in the vehicle concept. To the left and right of the powerdome, the bonnet blends precisely into the stronger flares of the front wings – a typical Porsche design trait. Also exuding confidence is the look of the LED headlights with their four-point LED daytime running lights, of which three versions are available. The new side body – like the bonnet, boot, roof and wings – is made entirely of aluminium, and it accentuates the silhouette of a sports car more than ever thanks to its dynamic roof line. At the rear, the roof line becomes the charismatic Porsche flyline – the distinctive lines that adorn all of the brand’s coupés. Two precisely executed edges on the lateral roof line visually lower the silhouette’s centre of gravity. The appearance of the side windows has also been redesigned, their visually continuous surfaces combined with lines on the rear body create a stylistic affinity to the Porsche 911. Three-dimensionality characterises the doors and wings, where incident light shining on the convex and concave surfaces generates muscular tension. Integral design components there are the air exhaust ports behind the front wheels. The flared lips of the wheel arches are also powerful and provide space for 20-inch and optional 21-inch alloy wheels. 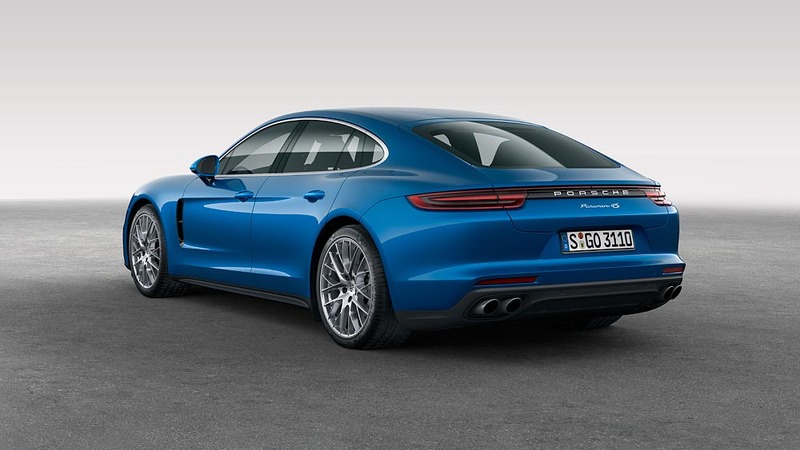 The rear of the vehicle now further highlights the Panamera’s four-door coupé credentials, distinguishing it from a conventional saloon. Features such as the three-dimensional LED rear lights that include integrated four-point brake lights, interconnected by a narrow LED strip result in a distinctive night design. Incorporated seamlessly and elegantly into the boot (which features electric opening and closing as standard), is the extendible rear spoiler that is now finished in body colour. On the Panamera Turbo, the wing also splits as it extends, thereby gaining additional surface area. Terminating the lower rear body is a diffuser into which the dual stainless steel tailpipes of the exhaust system are integrated on the left and right. The Panamera Turbo can be recognised by its trapezoidal tailpipe trim. The new Panamera exhibits a completely new interior design. In many areas, touch-sensitive surfaces replace classic hard keys, and high-resolution displays merge into the interior. In the luxury saloon segment, the digitalisation of the Porsche interior, which began with the 918 Spyder, has reached the next development stage aboard the Panamera in the form of the new Porsche Advanced Cockpit. From the low seat position typical of sports cars, drivers not only see a fascinating front-end landscape of the car’s wings and powerdome, but also two 7-inch displays that are placed directly in the driver’s line of sight for ideal ergonomics. Located in the middle of these two displays is the tachometer, which is still an analogue instrument. The gearshift console between the driver and the front passenger is dominated by the 12.3-inch touchscreen of the new generation Porsche Communication Management (PCM) system, which the driver and front passenger can configure individually. 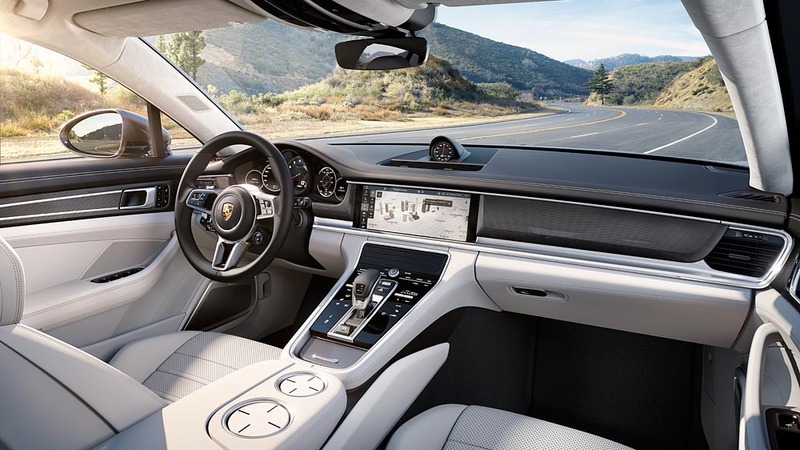 Naturally featured in the PCM are Porsche Connect, smartphone integration via Apple CarPlay and a new voice control system that responds to natural language input. The PCM area – with its high-end, high-resolution display – transitions harmoniously into the black panel concept of the centre console with a shift-by-wire gear selector for the PDK. A new control panel with touch-sensitive switches enables intuitive control of various functions. The louvres of the central air vent are electrically adjusted by touch-sensitive sliders, whilst rear passengers can control air conditioning and infotainment functions using an optional four-zone automatic climate control system. Details on market introduction dates and pricing will be announced soon.